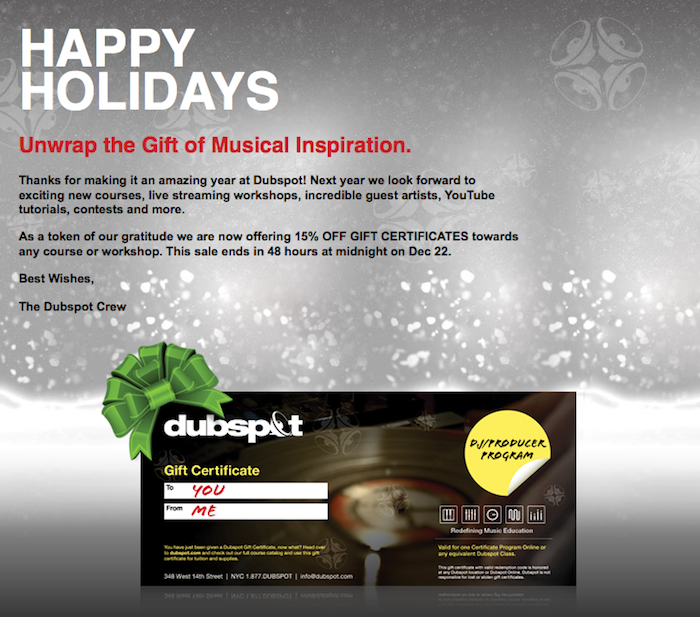 Give the gift of music with a Dubspot Gift Certificate this holiday season! Dubspot is offering a variety of savings on music production and DJ courses for any aspiring producer or DJ on your gift list. To order gift certificates, browse our course offering and then call 212.242.2100 or email info@dubspot.com. Check out a list of classes along with certificates below. Call 1.877.DUBSPOT (1.877.382.7768) to order. Dubspot celebrated Make Music New York Festival 2011 with a series of exclusive live performances and DJ sets from NYC’s best kept secret in the field of electronic music production and performance. The video above recaps the even which took place in front Dubspot’s HQ in Manhattan’s West Village.